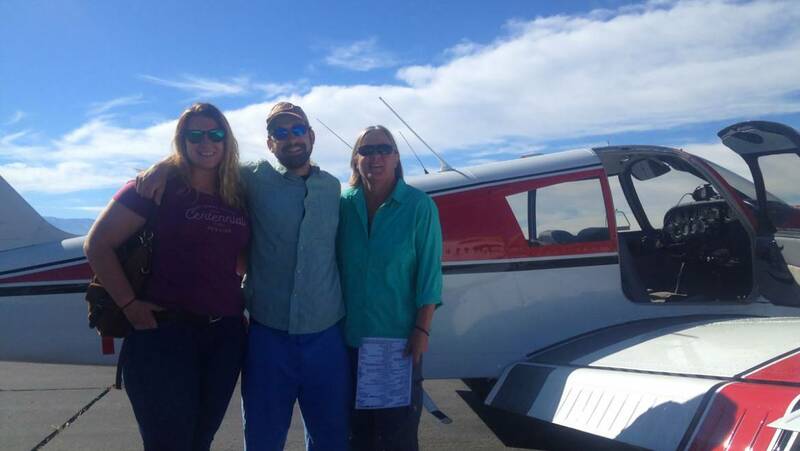 A prospective student pilot’s discovery flight is an exciting start to their lifelong love of aviation. The term “discovery flight” is thrown around a lot, but many people may not know what it truly involves. To help you make the most out of your discovery flight, we’ll discuss how you might prepare, what you should bring, and more. During your discovery flight, you’ll learn the basic elements of the airplane, learn the four fundamental flight maneuvers, and because of our unique location, get to see some amazing sights. Sunglasses! It gets very bright up there. I find bringing a water bottle is a good idea on your first flight because as you change altitude, your ears may need to pop and drinking water can help with that. Additionally, if you have a logbook, you should bring that, so that you can log your first hour of dual instruction time. If you have an aviation headset, bring it, but if you don’t, don’t worry! We have a headset here you can use for your discovery flight, and rent for $10/day when you begin lessons. Ailerons: on the back of the wing, toward the wing tip, there is a large moveable panel called an “aileron” (aye-lur-on) which controls roll. The ailerons are controlled by turning the “yoke,” the steering wheel of the airplane. When one aileron goes up, the other goes down. Elevator/Stabilator: Most airplanes are fitted with a horizontal stabilizer (the small “wing” on the tail of the airplane) which has a moveable flap called an “elevator.” The Piper Cherokee is fitted with a “stabilator” (stay-bill-ay-ter), which means the entire horizontal portion of the tail section moves, acting as both a stabilizer and elevator (hence, stabil-ator).The stabilator controls pitch, which points the nose of the airplane up or down. The stabilator is controlled by pulling back or pushing forward on the yoke. Rudder: The rudder is a moveable panel on the vertical portion of the tail. The rudder controls “yaw,” which is the side-to-side motion of the airplane. You control the rudders with the rudder pedals, which are two-foot pedals on the floor of the airplane similar to the gas and brake pedals in a car. Image from the Smithsonian National Air and Space Museum. Once your pre-flight is complete, you will climb into the left seat, and the CFI will sit into the right seat. 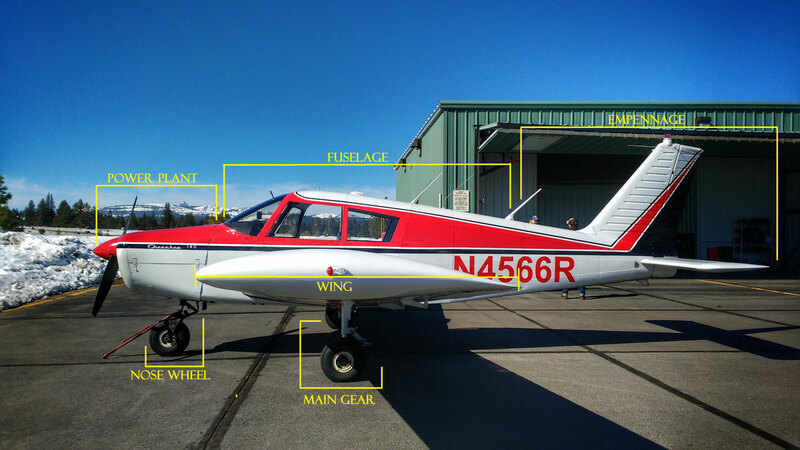 Your CFI will likely walk you through the start-up routine, and once the engine roars to life and the propeller is set in motion, it’s time to “taxi.” We call driving the airplane on the ground “taxiing,” and it’s an interesting and new sensation. Unlike in a car (or anything else for that matter), you control the direction of the airplane when it’s on the ground with your feet. 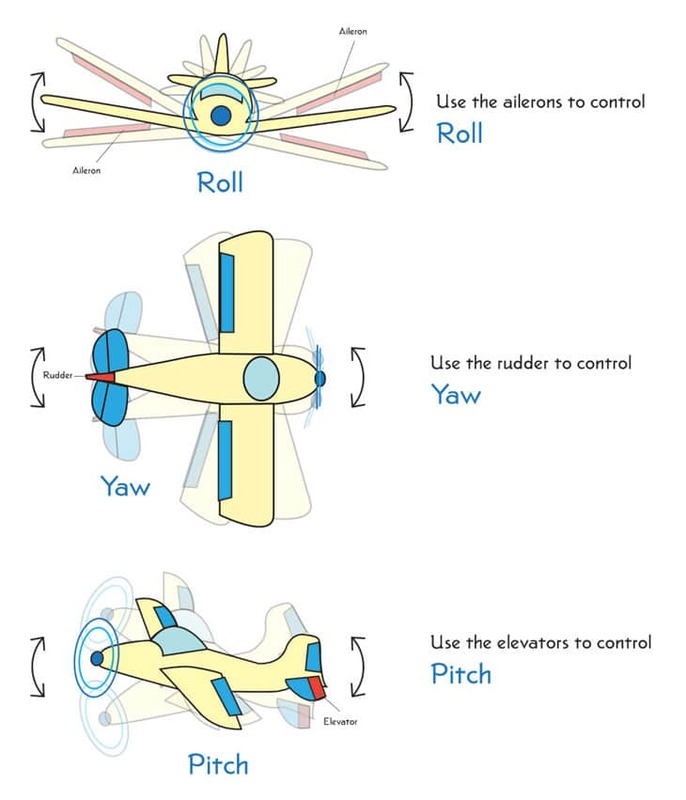 That’s because the rudder pedals are connected to the nose wheel, and like a tricycle, the airplane will follow whichever direction its nose wheel is pointed. It’s strange, but simple: Push the right pedal to go right, push the left to go left. Your CFI will instruct you on how to use the hand brake. Your goal when taxiing is to follow the yellow line. At first, this may seem like an impossible task, but soon it will become second nature. Before rolling onto the runway, the airplane will undergo one last checklist: the Run-Up or Pre-Takeoff Checklist. During this time, you will power the airplane up and check the functionality of all instruments and engine components. Once you finish this short process, it’s time to fly! Your first take off is one of the most exciting moments of your discovery flight. It’s the moment when you truly become a student pilot and peel away from the earth. 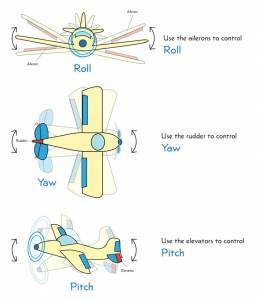 You will line the airplane up with the center line and slowly push in the throttle to full power. The airplane will pick up speed as it drives down the runway, and when you hit about 80-85 mph, your instructor will have you add “back pressure on the yoke” (pull the yoke toward your belly button) and the air rushing over the wings will pick you off the ground. Climbs: pull back on the yoke and add power if necessary to gain altitude. Descents: reduce power and point the nose below the horizon to lose altitude. Turns*: turn the yoke in the direction you want to turn to enter a turn. Straight-and-level: when the airplane is perfectly balanced in the air, wings level, not speeding up or slowing down. *Don’t worry about making coordinated turns by using the rudder your first time out- that comes later. 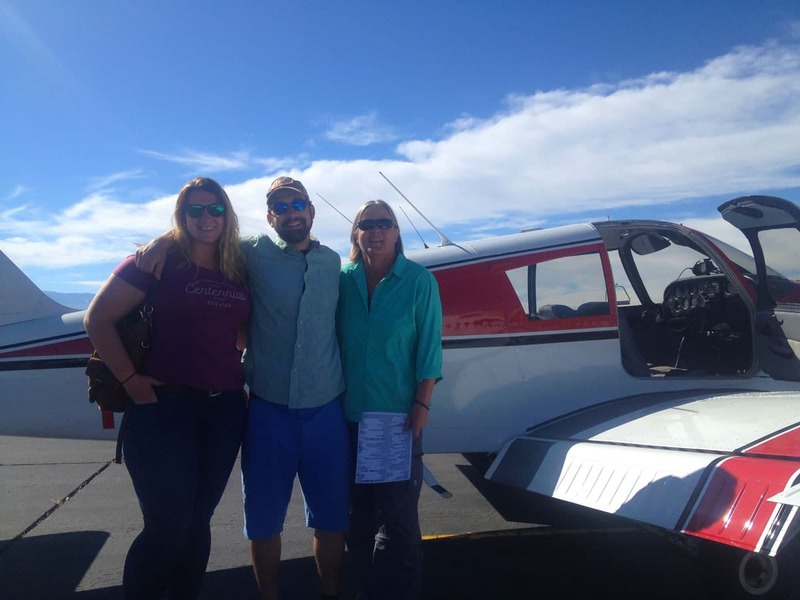 After you have some fun learning those maneuvers, your CFI may (or you can ask them to) direct you toward Lake Tahoe to enjoy your first birds-eye view of the largest alpine lake in the Sierra Nevada Mountains. Lake Tahoe looks so incredible from the sky, it’s hard to believe it’s real. During this time, you can ask your CFI to take the controls so you can take pictures if you’d like. This is one of the added bonuses of a Lake Tahoe, Minden, Reno discovery flight. When you’ve experienced the wonders of flight and learned a bit about controlling the airplane, it’s time to head home. Your CFI will point you back toward the airport, and will probably let you control the airplane up until landing when they will take the controls. Back on the ground, you and your CFI will secure the airplane (turn it off, tie it down, etc.) and possibly have a post-flight chat about your experience. 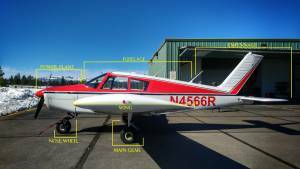 They’ll want to know your favorite and least favorite parts, and if you’re interested in earning your private pilot certificate when you’d like to start your official flight lessons. If you do decide to continue flying and training with us here at High Sierra Pilots, half the cost of your discovery flight can be applied toward your club membership! We offer this incentive simply because we genuinely believe there is nothing better in this world than aviation and being a pilot, and want everyone to elevate every day with the wonders of flight.